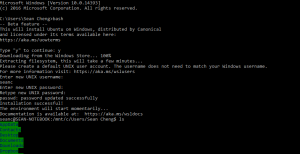 After installing Bash on Windows, the first thing I did like most users is to try out ping. Unfortunately it failed having an error. Google came to the rescue and found a fix for this issue. 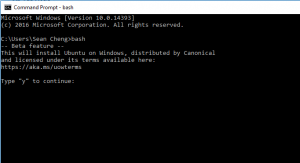 Recently I heard from a colleague that Windows has added Ubuntu bash to the OS. We have to be running a 64-bit version of Windows 10 Anniversary Update or later (build 1607+). Give it a moment, Windows will do some installation. 3. 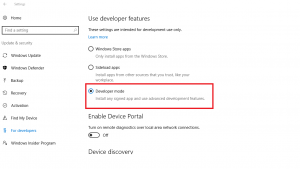 Enable “Windows Subsystem for Linux” – this is already part of the Windows package we have to enable it. Seems that i have already enabled it previously – thus no it is online and no need to restart. Once installed, you are good to go with Bash! 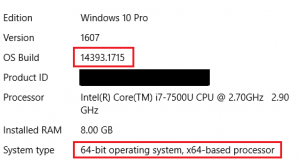 – so I was wrong, long waiting time as usual with Microsoft. 20 mins later still installing – come on Microsoft you can do better. Argghh all it needed was to press enter, might have been faster. Alright! all set ready to have a Bash! It becomes irritating when cloning a server only to get the hostname error again. Resolution includes looking at 2 files. In /etc/hostname ensure the hostname of your server is updated, matches the current hostname of the server you are using. I’m a totally lazy blogger, takes me ages to update this page. And effectively I have nothing much to blog about. At current mucking though a Discord Bot in C# – nothing really last too long. Lets see what can be done with this and how long this last. The setup is ready. – Running Visual Studio Code on my Ubuntu 16.04 Cloud server. – give me a shout-out if anyone happens to stumble upon this and requires a tutorial or something. And so the 403 Forbidden issue has been fixed, despite countless tries at deleting .htaccess and changing the permissions. It was Qoxy technical support team that solved the problem. According to the team it was a security setting that cause the reoccurring permission issue. This would be my first tutorial of a headless installation, we will be using Steamcmd and Rocket to get the server running. There are 3 parts to this installation. 1. Install the pre requisites the programs required to run Steam and Rocket. Steps as follows, got to https://rocketmod.net/get-rocket# get the download link or use the below link if it has not expired. At this point you would want to create a new steam account to run the server. Different from the account you use to play the game. Replace USERNAME and PASSWORD with your steam username and password. Its fairly simple but it took me 3 days to muck around and get the files in the right place for the setup. once all the files are downloaded. In the Next post i will talk about how to run the Server and how to configure. I’m no expert so feel free to leave comments below. Some sources for this project which I got most of the information from. I’ve been fussing over unturned headless server for the past 3 days. Finally got it to work and wanted to write about it. first order of business, getting this blog up running straight. have been plagued with an evening of WordPress 403 Forbidden error. lets give a while to see if the solutions works. I’ll be back as soon as the solution shows itself to work. Hello World! -Yes every Programmers first program. Welcome to the blog that documents me mucking around the world of IT, building servers mainly headless Ubuntu server. Author seancPosted on 25 January 2017 25 January 2017 Categories World of ITLeave a comment on Hello World! -Yes every Programmers first program.